There is a house located on the backstreet, a block away from Sakurada-dori and a 5-minute walking distance from Gotanda Station, where a family of thirteen–– consisting of a great-grandmother, two grandfathers, their sons and their respective families––live. The first floor of the house used to be a storage of a liquor store formerly run by the family. This time, we converted the first floor into a “kakuuchi” (customers buy drinks at a liquor store and drink at a standing bar inside the store) style “izakaya” (Japanese-style pub). The family members participated in the entire process from design to construction to build this store. Kuwahara Shoten owns a building at the corner of this street and Sakurada-dori, where they had been running a liquor store serving the community for a long time. 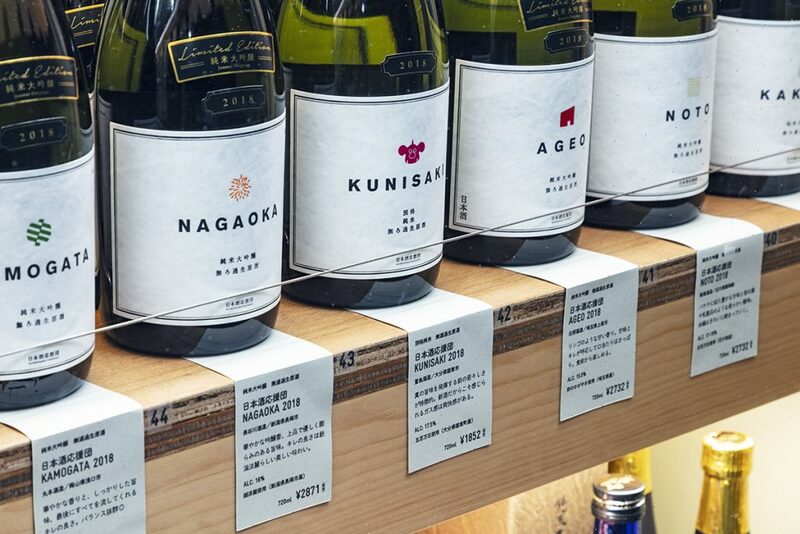 Along with the change of the times, they changed their store style (converted it into a convenience store) and have maintained their liquor business up to today. 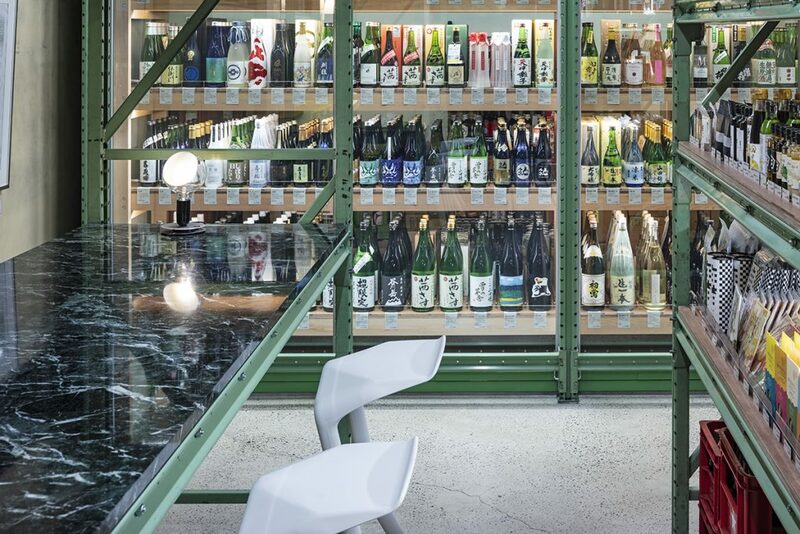 They had been temporarily running a kakuuchi style “storage-turned-izakaya” in this space for a while. 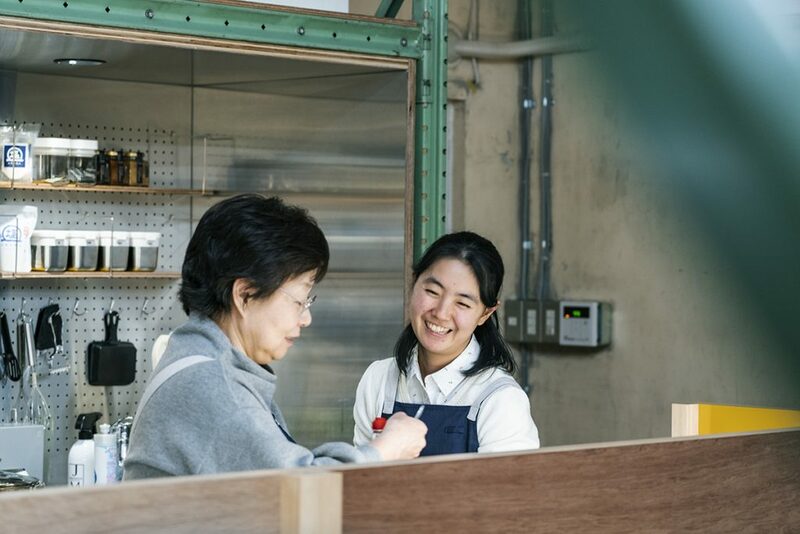 But the family decided that they want to create a pleasant work place where the entire family can work happily instead of continuing a conventional kakuuchi based on low prices, and visited us to discuss this matter. 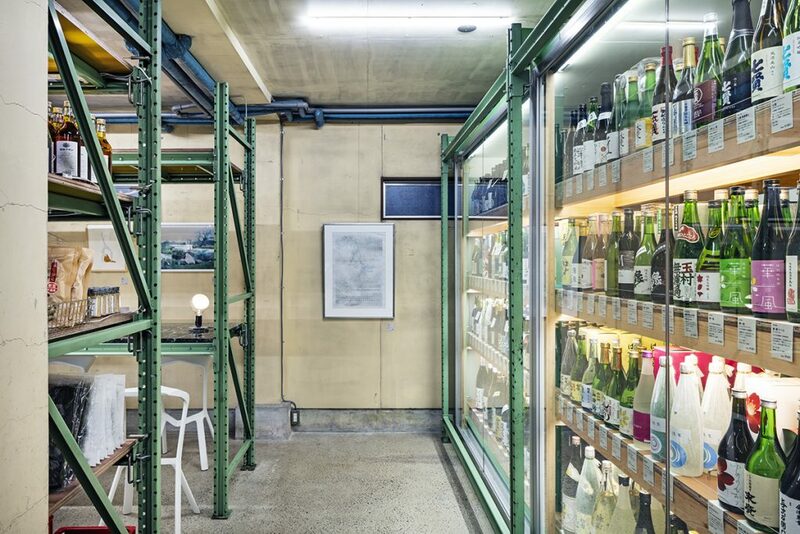 We actually found the atmosphere of the “storage-turned-izakaya” very refreshing––and decided to brighten up and renew the space by clearing residues from the past and the somewhat gloomy air, while making the best of existing spatial characteristics. 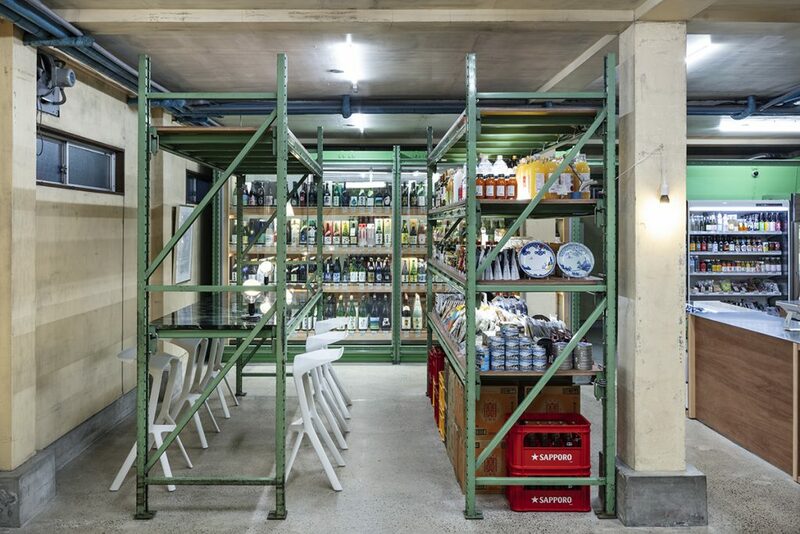 We kept the existing steel racks, window frames in the existing storefront, floor, walls, and ceiling as much as possible and scattered new elements here and there that make people think, “It looks different! What’s happening here?”. 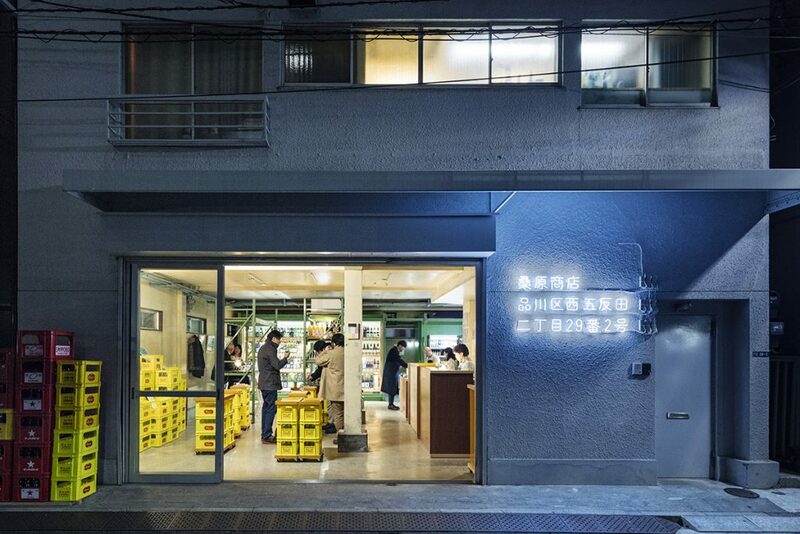 As a result, the “storage-turned-izakaya” revived itself while starting to circulate the air around it, and consequently the backstreet lined with parking lots and storages, which had been used as a sort of “backyard” behind this neighborhood for a long time, is beginning to look like a street where something interesting is happening. 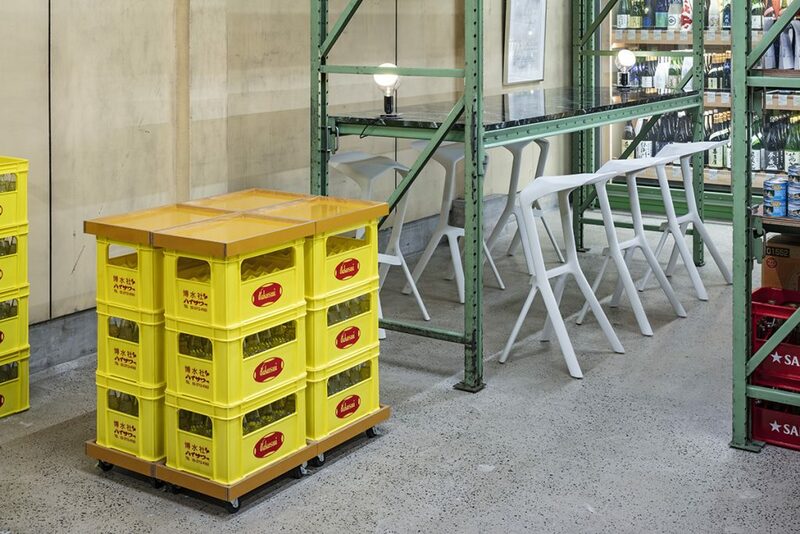 Customers can use beer bottle crates to sit on or stack a few of them to create a makeshift table at a convenient height according to their drinking styles. 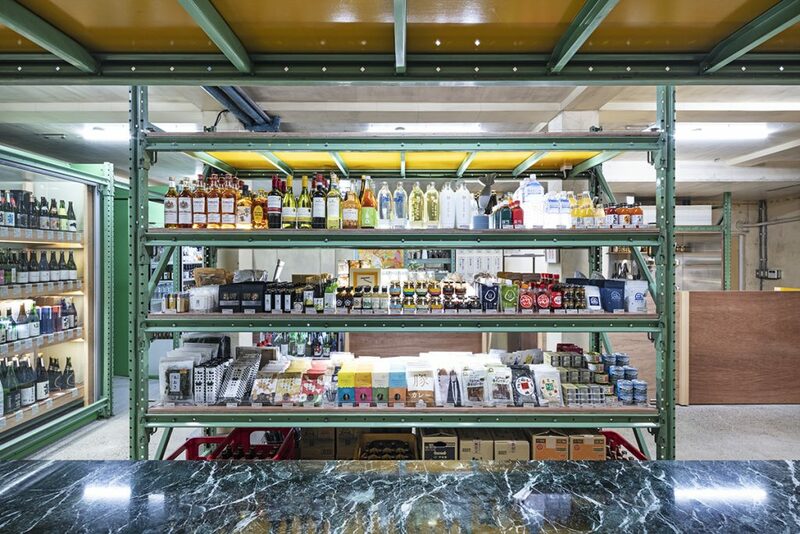 This system provides flexibility to meet various needs in this store.